I need to be 100% honest with you guys. .I haven't had any time to go thrifting this week. So I'm going to cheat this week and just blog about this dress I wore to the funeral services. I thrifted this dress back in December to wear to our wedding lunch. I absolutely fell in love with the print and style of the dress. 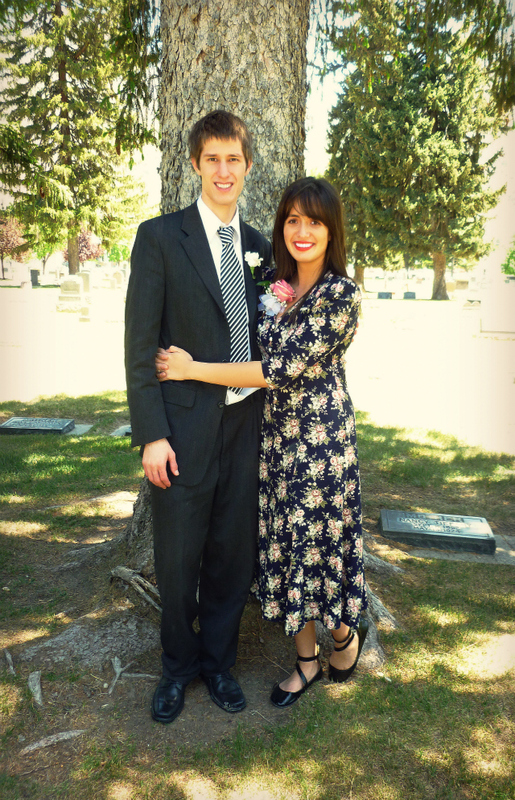 The dress was only $5 I believe and for a wedding lunch dress it was a steal. All of the dresses I liked on etsy at the time were over $70. I was originally going for a 60's inspired look but I really love the 80's and this dress seemed to have a bit of that and a modern touch to it. Link up to a specific blog post about thrifting. Link parties will end every Sunday at 11:59PM! Your dress is adorable, and PERFECT with those little black shoes! I'm not sure if I've already told you this, but I absolutely LOVE your blog. I recently found it and it's absolutely a new favorite! You look so nice <3 ! Just found your blog! Love it! Check mine out too! your grandma's funeral must have been a emotional one for you. she is at somewhere better now. the sweet memories of her will forever live in your heart. thank you for the linky. lovely picture...you look beautiful together, that dress is a fabulous find, florals are so on trend now. it makes my heart sad that this was at a funeral. but you look just so beautiful too. sending you my love. xo.